As debate around the immigration reform bill is expected to heat up on the Senate floor, a contested provision allowing for some non-criminal deportees to return to the United States remains intact. For how long, no one is quite sure. The controversial measure, outlined in Section 2101 of the current bill, would permit deported immigrants with children, parents, or spouses who are currently U.S. citizens or legal permanent residents to petition for a waiver to return to the U.S. and apply for Registered Provisional Immigrant (RPI) status. While reprieves have been granted to undocumented immigrants residing in the U.S. in the past—under the Immigration Reform and Control Act of 1986 and President Obama’s DACA memorandum last July—never before has a Congressional or Executive effort to overhaul immigration policy contemplated the return of deportees. 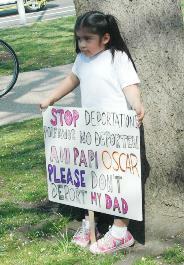 The “right to return” provision survives even as the rate of deportations continues to soar. Since 2009, the Obama administration has removed 1.5 million unauthorized immigrants and is on track to surpass 2 million by the end of fiscal year 2013. According to recent federal data unearthed through a Freedom of Information Act (FOIA) request, 205,000 undocumented immigrants with at least one U.S. citizen child were deported between July 2010 and September 2012, representing an average of 90,000 per year. The contentious deportee measure stems from acknowledgement on the part of the bill’s authors of the destructive effects that these enforcement policies have had on American families, particularly U.S. citizen children. A spokesman for Senator Marco Rubio, one of the bill’s most conservative drafters, noted that the Senator had “personally concluded that giving parents a chance to reunite with their children was the right thing to do.” The toll that family separation takes on the mental and physical health of children has only recently attracted serious attention, with studies suggesting links between parental deportation and depression, separation anxiety disorder, post-traumatic stress disorder, and poor cardiovascular health. Central to the compromise reached by the bill’s sponsors – known as the Gang of Eight – is the question of how to prioritize family reunification without shattering the bill’s prospects. The argument from the right has been that in promoting family-based immigration, the 1986 reform prompted the larger waves of immigration seen since then. In response to these concerns over “chain migration,” however exaggerated they may be, the proposed legislation calls for a gradual move away from the family-based immigration model, eliminating some 90,000 annual visas given to the siblings and married adult children of legal immigrants and granting up to 110,000 visas to immigrants skilled in science and math. Democrats have viewed this shift toward a more comprehensive “merit-based” system as a necessary compromise, but have built into the bill measures such as the “right to return” as well as an expedited path to citizenship for DREAMers (the children of unauthorized immigrants) and a clearing of family-based immigration backlogs – all of which vindicate the importance of the nuclear family. It is time for Senators from the right to follow the lead of Republican drafters and make some concessions of their own, including the Gang of Eight’s compromise to allow for the reunification of families torn apart by a decade of immigration enforcement policies run amok. Immigration reform must have as its foundation a concern for family unity and a respect for what families contribute to our society. It should also take into account the welfare of 4.5 million U.S. citizen children in mixed-status homes who will be better equipped to contribute to our society if they have the opportunity to grow up in the presence of their parents.